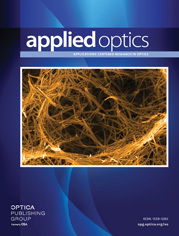 The authors are with the Departamento de Optica, Universidad Complutense, 28040 Madrid, Spain. A holographic optical system for checking human depth perception is proposed. The system does not use any kind of dissociative element; it uses incoherent light for the reconstruction of holograms and allows the binocular disparity to vary from 0 to 650 arcsec. The depth perception of observers can be checked in conditions closer to normal life. a Proposed model: t = β0 + β1E + β2E2 + β3E3.